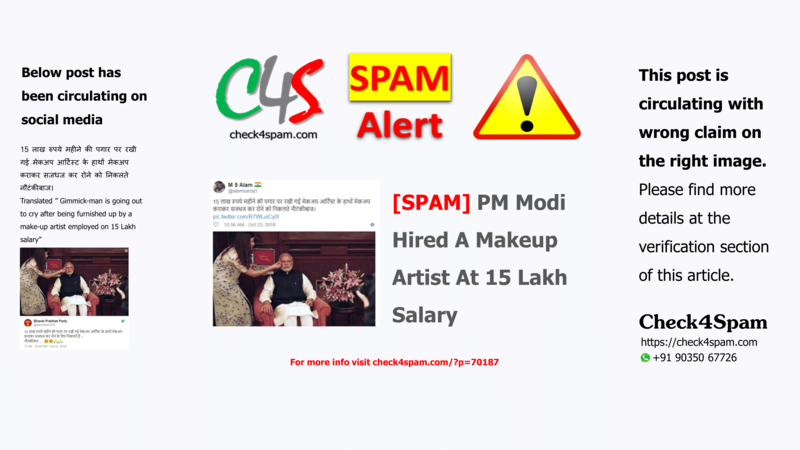 This post that claims that PM Modi hired a make up artist at 15 Lakh salary circulating on social media is fake. Please find more details at the verification section of this article. When the news is about our PM, we are very curious to share it with others. Excitement about the news becomes so high that we ignore our senses to know the truth behind the news or post we get from various fake origins. This is also such kind of post that we came across on social media and is spreading like fire. Lets not believe such hoax immediately, rather go through the internet and find the facts about it. For your information the image is taken when our PM was posing for the Madame Tussauds. Madame Tussauds is a Wax Museum. This photo is from March 2016 and this was part of the work that you can watch in the video below. There are wax statues of many celebrities like Salman Khan, Aishwarya Rai, Amitabh Bachchan and many International personalities. Our PM Modi’s Wax Statue can be seen as an Indian Personality at the Madame Tussauds London, Singapore, Hong Kong and Bangkok. This is such a good news. But by giving it wrong captions by some fake people, the excitement is reduced. Below is the video that shows the fact. Now you know what is the truth. Be careful about what you recieve and what you spread further. Check4spam and Share the facts. Some more stills from the real video that you can share as “Fact”. Know more about Madame Tussaud London. Its a beautiful place to visit and watch the creations. Don’t miss out beautiful Indian Actress Madhuri Dixit, Shahrukh Khan and many others famous personalities.